Friends of the Garden presents “Romance in the Garden” Friday night and Saturday night (10/26-10/27) at the Mizumoto Japanese Stroll Garden at Nathanael Greene-Close Memorial Park, 2400 S. Scenic in Springfield. Walk the garden at night with lanterns and luminaries lighting the paths. Wishing lanterns for floating on the pond will be available for purchase. Admission is $10 for an individual or $15 for a couple. The History Museum on the Square will host Haunted Bus Tours Friday night (10/26) from 5:30 to 9:30 in downtown Springfield. The cost is $20. See the site of Springfield’s first city cemetery, the location of a mass grave from the Civil War, and hear stories about haunted buildings and who the ghosts might be. The City of Battlefield will host the City Hall Haunt Friday night (10/26) from 5:30 to 7:30 at 5434 S. Tower Drive in Battlefield. The event will include animals from Dickerson Park Zoo, trunk or treat, hot dogs for sale and more. The Gillioz Theatre, 325 Park Central East in Springfield, will present “The Rocky Horror Picture Show” Friday night (10/26). Doors open at 6:30, and the film will be shown at 8. The night will also include a costume contest and a raffle. Fall Sip and Savor will be held Friday night (10/26) from 7 to 9 at the Discovery Garden Montessori School at National Avenue Christian Church, 1515 S. National. Tickets are $27. Venture Church, 1515 W. Elfindale in Springfield, will host a Fall Fest Friday night (10/26) from 6 to 8 with rides, games, inflatables, food trucks, a petting zoo, candy and more. For more information, (417) 831-7242. The Ozark Vintage Trailer Rally is Friday through Sunday (10/26-10/28) in Eureka Springs, Arkansas. The 10th annual Voices from Eureka’s Silent City event continues Friday and Saturday (10/26-10/27) in Eureka Springs, Arkansas. The one-hour walking tours through the Eureka Springs Municipal Cemetery will feature actors in period costumes telling stories of their colorful pasts. Proceeds benefit the Eureka Springs Historical Museum. The Schweitzer Brentwood Branch Library presents Stories After Dark Friday night (10/26) at 6:30 for kids in kindergarten through third grade. It offers creepy tales, spooky snacks and ghoulish games. Drug Take Back events will be held at various locations in Springfield and other parts of the Ozarks Saturday (10/27). Anyone can take prescription drugs for disposal. The program, “Ghostly Glades,” is Friday night and Saturday night (10/26-10/27) from 6 to 9 at Wildcat Glades Park in Joplin. Take a guided hike to learn about spooky critters in nature, and discover truths about mysterious beings. Registration is required. The Labyrinth of the Goblin King Masquerade Ball will start Friday night (10/26) and Saturday night (10/27) at 7:30 at Joplin Little Theatre, 3009 W. First St. in Joplin. Harvest Fest continues through Sunday (10/28) at Rutledge-Wilson Farm Park, 3825 W. Farm Rd. 146 in Springfield. 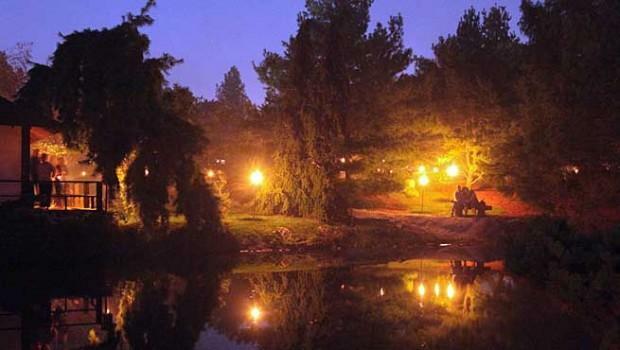 The event features hayrides, a pumpkin patch, a haunted trail, a corn maze and more. A Student Composers’ Concert starts Friday night (10/26) at 7:30 in Ellis Recital Hall on the Missouri State University campus. Hear music composed by MSU students. The Missouri State University Theatre and Dance Department presents “Amelie” through Monday (10/29) in Coger Theatre. A Fall Leaves Hike will start Saturday morning (10/27) at 8 at Shepherd of the Hills Conservation Center in Branson for ages 12 and up. Registration is required. The Springfield Conservation Nature Center will host a naturalist-guided hike at Piney Creek Wilderness Saturday (10/27). Registration is required. Thriller on C-Street is Saturday (10/27) on historic Commercial St. in Springfield. A kid friendly performance starts at 4. After that there will be games, a DJ and more. The Dr. Deadalous Traveling Zombie show starts at 7, and the C-Street Zombie Corps will present Thriller on C-Street at 7:30. Tickets are required. Downtown Nixa will host the first annual Ghost and Goblin Bash and Creepin’ at the Crossroads Saturday (10/27) with music by live music, a beer garden, games, a haunted maze, a costume contest, children’s activities and more. The Queen City Halloween Pub Crawl will be held Saturday night (10/27) at 17 downtown Springfield venues. The Southwest Missouri National Organization of Women will host the Stand Up Speak Out Domestic Violence Awareness Event Saturday (10/27) from 4 to 7 p.m. on Park Central Square. The program, “Epitaphs and Engravings,” will be held at 1 p.m. Saturday and Sunday (10/27-10/28) at George Washington Carver National Monument in Diamond. Learn about the symbols and engravings on tombstones at the Carver Family Cemetery. The Missouri State University Football Bears will host Southern Illinois Saturday afternoon (10/27) at 2 at Plaster Stadium. Bearfest Village opens at 11 a.m. north of the stadium. Learn more here. Champion Athletes of the Ozarks will host a bowling tournament Saturday (10/27) from 1 to 3 p.m. at Enterprise Park Lanes, 1625 S. Enterprise. Kids can trick or treat Saturday night (10/27) at Battlefield Mall, 2825 S. Glenstone in Springfield. Participating retailers will have a ghost balloon at their entrances. The program, “The Animals of Harry Potter,” will start Saturday morning (10/27) at 10:30 a.m. at the Library Center. Dickerson Park Zoo will bring animals you might have read about in the Harry Potter books, and there will be animal crafts and activities. The Monster Mash Costume Parade starts at 11 Saturday morning (10/27) at the Library Station. Kids are invited to dress in costume and join in as they collect treats through the library. First and Calvary Presbyterian Church, 820 E. Cherry in Springfield, will host a fall festival Saturday (10/27) from 3 to 5 p.m. with food, games and trunk or treat. For more information, (417) 862-5068. The Antiques Festival of the Ozarks is Saturday (10/27) from 9 a.m. to 5 p.m. and Sunday (10/28) from 10 a.m. to 4 p.m. at the Ozark Empire Fairgrounds E-Plex, 3001 N. Grant. Admission is $6 for adults and $3 for kids. The Veterans Benefit Concert will be held Saturday (10/27) from 10 a.m. to 2 p.m. at Minnie Harris Park in Harrison, Arkansas with music by Whistlin’ Dixie. Proceeds will benefit DAV Chapter 6 in Harrison. The event will include a silent auction, a bounce house, a travel voucher raffle, vendors and BBQ. The Third Traditional Chinese Dance Show is Saturday night (10/27) at 7 in the Plaster Student Union Theater on the Missouri State University campus. The Little Acorns program, “Bear Tales,” will start at 11 Saturday morning (10/27) at the Springfield Conservation Nature Center. It’s for ages three to six. Registration is required. The Ozarks’ Coin Club will host the Annual Fall Coin and Stamp Show Saturday (10/27) from 9 a.m. to 5 p.m. and Sunday (10/28) from 9 a.m. to 3 p.m. at the Ozark Empire Fairgrounds. The 20th annual Newton County Home Tour is Saturday (10/27) in and around Harrison, Arkansas featuring four homes and one bed and breakfast. Proceeds benefit Newton County Single Parent Scholarships at North Arkansas College. Lutheran Family and Children’s Services will host the Princesses and Me Tea Saturday morning (10/27) at 10 at the Oasis Inn and Convention Center, 2546 N. Glenstone. Celebrate OcTUBAfest Sunday (10/28) at 3:30 with solo, duet and chamber music performances in Ellis Hall on the Missouri State University campus. Howl-O-Ween Spooktacular will be held Sunday (10/27) from 7 to 9 p.m. at Turpentine Creek Wildlife Refuge in Eureka Springs, Arkanas. The event will include hayrides, food, costume contests, games, giveaways, a bounce house and a chance to see the animals at night. There’s an admission fee. The Sounds of Autumn Concert Series wraps up Sunday afternoon (10/28) at 2 at the Peace through People Pavilion at the Springfield Botanical Gardens, 2400 S. Scenic. The featured performer will be Dallas Jones. Take lawn chairs or blankets. Sunday Sounds will present The Shandies Sunday afternoon (10/28) at 2 at the Library Station.